My general policy is that I don’t get political on this blog. Online political arguments are as draining as they are futile, and my politics are such that I get crap from liberals for being to conservative, and crap from conservatives for being too liberal. Besides, this is a writing blog, and while my political philosophies are part of the ether that informs my fiction, I tend to focus more on universal human experience than on fictionalizing my viewpoints. Political fiction is not always a bad thing, of course: we wouldn’t have Animal Farm or The Handmaid’s Tale without it. It’s just not what I do. So why the post on feminism? It starts here. Basically, Science Fiction Writers of America (SFWA) has been mired in a sexism scandal. It started in their bulletin, a respected professional publication, with an eye-rolling cover of your typical chainmail bikini “warrior woman” and an editorial about “lady editors” in which the two male authors waxed poetic about how their colleagues were knockouts (if you’re skeptical about how problematic this is, when’s the last time you heard someone sing the praises of Gordon Van Gelder, editor of The Magazine of Fantasy and Science Fiction, and include extended references of how he looks hot in a Speedo?) Things got worse the next issue, when Barbie was named as a role model for women because, among other things, “she maintained her quiet dignity the way a woman should.” And the next issue, they just kept digging when the two men who wrote the “lady editors” piece wrote another article, complaining that they were being censored for their views, and that it’s silly that people got so upset over the fact that they called the female editors beautiful. One of the interesting things about these sorts of situations is that what has come to the surface is, to use an apt cliche, the tip of the iceberg. The fact that any of what was published in the SFWA Bulletin was considered at all appropriate to begin with is indicative of the deep seated sexism within the science fiction community, which is indicative of the sexism within the general community of authors and publishers, which is indicative of the sexism in our society. 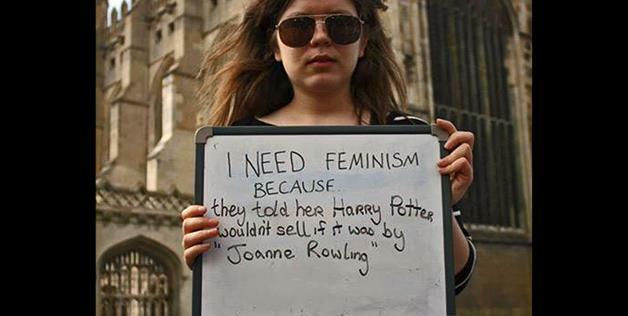 I started this post with a picture from a campaign in Cambridge, England, where people were given a whiteboard with “I Need Feminism Because” written on the top, and were asked to finish the sentence. The answers are worth your time, and you can find more here. Think about the picture I included here, though. We know her as J.K. Rowling because her publisher insisted that she use initials instead of her name, because young boys would not read a fantasy series about boy wizard if it was written by a woman. And you know what? They’re not wrong. People assume that when a book is written by a woman, or is about a woman, it’s to be categorized as “chick lit,” appropriate for female consumption but not for a general audience. Boys in particular are adverse to reading things they perceive as “girly,” either because the main character is a girl, or because the author is female. This problem is particularly pronounced in the world of science fiction, fantasy and horror. While there have always been women in these genres (Frankenstein‘s Mary Shelley for the win) for a long time it’s been a male-dominated field, and, as the SFWA kerfuffle aptly illustrates, there are deeply ingrained attitudes that still make things hard for women writers and editors. Connie Willis is one of the most respected science fiction authors today, and still she gets groped (onstage!) by Harlan Ellison. When I started to seriously consider sending my work out for publication, the possibility of using a pen name came up. I write science fiction and horror. I know that there are people out there who will not read my work because it’s written by Eileen Maksym, just like there are people out there who would not read a book called Harry Potter and the Philosopher’s Stone that’s written by Joanna Rowling. Should I go by E. Maksym? Or another name entirely that obscures the fact that I’m a woman? Absolutely not. Because refusing to be publicly identifiable as a woman is not part of the solution, it’s part of the problem. Because every woman who hides their gender to be accepted is one less woman to stand up and be counted. Because the world of science fiction needs women who prove that we are here, we are capable, and we deserve and demand respect. Do we really *know* that book sales go down when they have a woman’s name on the front? Has anyone actually done a controlled study? I doubt it. It would be very difficult to do. You could publish a book by E. Maksym on the West Coast and Eileen Maksym on the East Coast, but then you have introduced a confounding variable (geography). By the time Harry Potter was gaining in popularity, virtually everyone knew that J.K. Rowling was a woman. And yet she still went on to be more popular than J.R.R. Tolkien (hmm … initials … I wonder if Tolkien was a woman). As someone who doesn’t read a lot of fiction, I fear that the publishers and writers are getting too caught up in a cult of personality — the idea that the name on the book matters more than what’s inside the book. But I’m sure if you went down to the playground and asked 5 black guys if they needed a white guy, they would have known the truth. The gatekeepers (coaches, agents, publishers) are always more bigoted than the participants (players, writers) and audience (sports fans, sci-fi readers), because they have built their success in the bigoted world. It doesn’t mean they are right. Although it can’t be proven (because you cannot set up and carry out a controlled experiment), there were many authors in the past that have had to use a pseudonym even to just get published. You might think that was when society was sexist, but the point is, is still is – it may not be as obvious to you as it was back then – but it is still there – in every society.